Magma was established in 2003 by Martin Ostermann and Lena Kleinheinz. The Ohio native Ostermann is a former senior architect at Studio Daniel Libeskind. 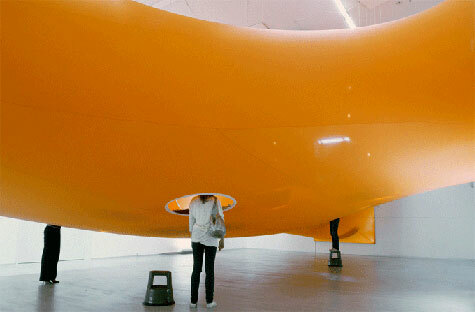 The Denmark-born Kleinheinz is an exhibition designer. 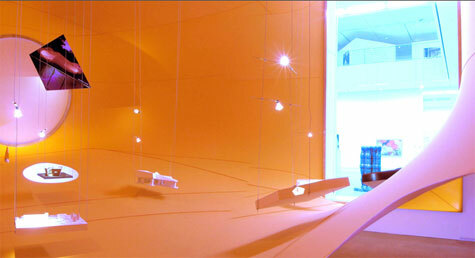 Magma is known for its inventive, experimental and experiential approaches to architectural work. 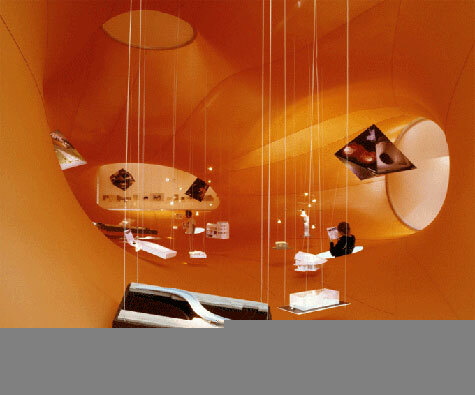 The main feature of Berlin’s Magma Architecture is an alarmingly orange flexible fabric (polyamide-elastan mix) stretched between the walls, ceiling and floor. The fabric is the most visible part of the exhibit, yet it is also the tool with which the viewers can focus on smaller details. Visitors bend down under the fabric into which openings were cut. Through these holes, visitors pop their heads up into the orange space to view drawings, models and photographs suspended from wires.